I had made up my mind not to write any piece relating to politics this week. Partly because I wanted a breather from all things political, as Nigeria gets closer and closer to the appointed time for the 2015 elections. But, you know how it is; man proposes, God disposes. As soon as you look away for a moment in these times, something else happens that you simply cannot ignore, which is exactly what happened to me this week. Many Lagosians will not forget in a hurry, the protests by the previously dormant Oodua People’s Congress, a Yoruba ethnic militia group based in the South West, and the so called Coalition of Concerned Nigerians against the Independent National Electoral Commission Chairman, Prof. Attahiru Jega, last Monday, because of what they claimed was the poor distribution of the Permanent Voter Cards in the South among other issues. 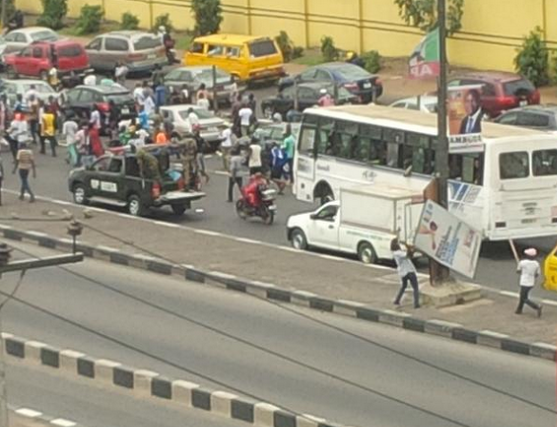 The faction of the OPC which carried out the protest was seen brandishing weapons such as guns, machetes and knives, harassing motorists and pedestrians as they disrupted traffic in major parts of Lagos, particularly on Ikorodu Road, where they destroyed any campaign poster of certain political parties in their path. It is also important to note that the other day, there were protests by the Movement for the Emancipation of the Sovereign State of Biafra in Awka, Anambra State. They were also calling for the resignation of the INEC chairman and rejecting the use of card readers in the forthcoming elections. Could this be a coincidence? Or, the last ditch efforts of a sinking government to ensure enough confusion in the land and hassle a good number of the populace into voting the President for a second term. The President met with the leaders of the OPC in Lagos in a calculated move to secure their votes and those of their members and less than four days after the meeting, the streets of Lagos knew no peace, thanks to the group. The Yoruba proverb, “The witch cried yesterday, and the baby died today…” readily comes to mind and rings so true in this scenario. Yet, the leader of the faction of the OPC group that executed the protest claimed that it was non- partisan! When it was clearly a pro Jonathan rally. If the OPC is truly non-partisan, why didn’t the protest take place at any other random time or before the President’s alleged largesse? It is a well-known fact that politicians employ different strategies and tricks during the politicking period in a bid to woo the electorate to vote for them. However, when a politician of the stature of the President who is still battling terror caused by a militant group in a section of the country decides of his own accord to “resurrect” another militant group (who also have a bit of a violent history, but by some miracle have been mostly reduced to playing the role of security guards in residential areas of the South-West) by engaging them for whatever purpose, then there is a big problem and we all might just be sitting on a time bomb which will explode sooner than later. It was not enough that the OPC was awarded a lucrative contract worth billions of naira to secure crude oil pipelines in the South-West, the group had to be used as agents for fomenting trouble all because of the desperation of one man to cling to power at all costs! At this stage, the President should be aware that the die is all but cast. Most people know who they are going to vote for come Saturday, and no amount of coercion will change most minds that have already been made up. Trying to win votes by intimidation or violence will always be a move in the wrong direction. It is rather sad that the one who should be aware of this the most appears to be too desperate to care. With Boko Haram still proving to be a huge mountain to surmount despite the relative success of the Nigerian Army in tackling them in recent times, and the Movement for the Emancipation of Niger Delta as an ever present threat to national peace should President Jonathan lose the March 28 election, it is foolhardy and portends no good for anyone to wake a sleeping dog, which in this case is the OPC who have been generally quiet and peaceful in the last few years. Mr President may just regret this costly mistake he has made by frolicking with the ethnic militia group if he wins the election, as he will have to deal with the monster he helped create…or in this case re-create.